Parker 45 fountain pen, made in the 1970s. 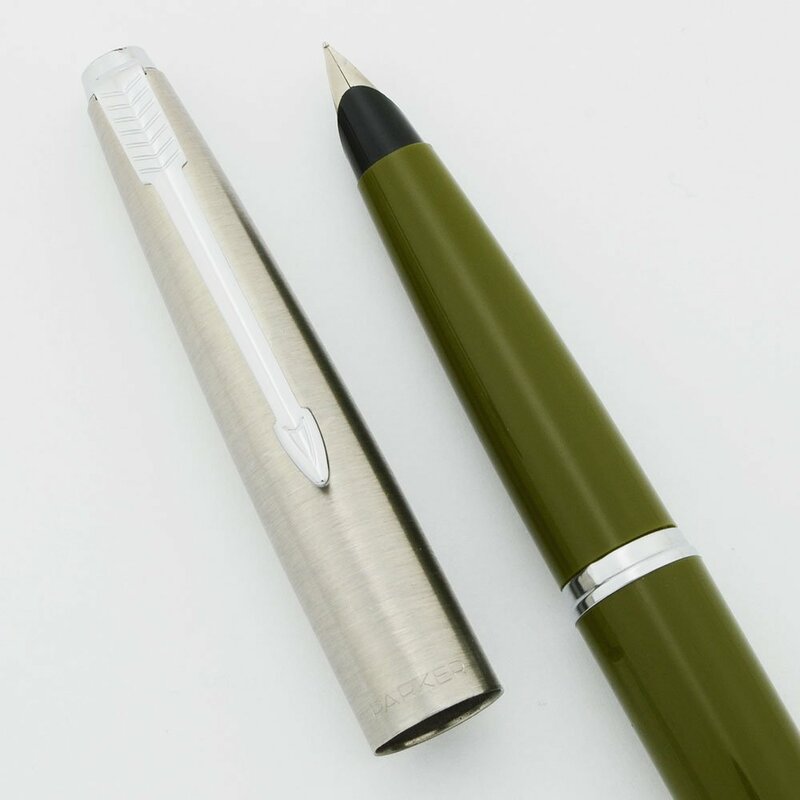 Cartridge/converter filler in olive green with a brushed steel cap and chrome trim. Extra fine steel nib is smooth and firm. Excellent condition. Filling System Fountain pen takes Parker cartridges, or converters. We will include one cartridge. Color Olive green body with flighter (brushed steel) cap, chome trim, an arrow clip, and a conical cap tassie. Nib EXTRA FINE steel nib. It writes smoothly and has a large amount of tipping material. The nib collar says X for extra fine. Condition Excellent condition with good barrel color and a very shiny cap. The barrel and section have light wear only. There is a very clear chalk label on the barrel, "45 STD DE LUXE". The cap has a couple of small shiny scratches, as well as one nick on the upper edge of the tassie and two little nicks under the tassie.